State Government Yield Spreads – Do Fiscal Metrics Matter? Spreads of state development loans (SDLs) relative to the yields of central government securities of corresponding maturity appear to be caused by illiquidity and prevailing market conditions. Nevertheless, inter-state variations are hardly observed in market pricing of the loans in primary auctions. This presents little market incentives for state governments to improve their fiscal positions and lower their debt. 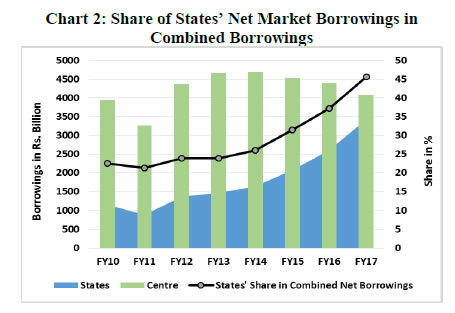 The spreads on state development loans (SDLs) that come in the form of market bond issuances measure the premia of states’ loans over central government securities and could be affected by a) SDLs being sub-sovereign securities; b) lack of liquidity in the secondary market for SDLs; and, c) differing fiscal parameters of state governments. Apart from prevalence of buy and hold investors for SDLs, most states have till recently, preferred to issue fresh papers, thereby failing to create security-wise trading volume even as the quantity of the outstanding remains significant. Consequently, state securities are not actively traded and hence attract high illiquidity discount. We document that although the spreads of SDLs relative to the central government securities caused by such illiquidity and prevailing market conditions are evident, inter-state variations in spreads are hardly observed in the market pricing of SDLs in the primary auctions. This presents little market incentives for state governments to improve their fiscal and debt positions. Chart 1 shows (for one sample date) that yield differentials across states are marginal, despite material differences in deficits or their debt to gross state domestic product (GSDP) ratio. This lack of inter-state variation has been observed to be a persistent feature of data over time (results available upon request). Academic literature shows that in general, credit markets of several economies do not assess debt levels or fiscal creditworthiness of sub-nationals, particularly in situations where they are expected to be bailed out by the national governments in times of financial distress, e.g., as in Germany (Schuknecht et al. (2009)). Provinces in Canada, despite high deficit levels have not attracted very high premium, as they receive transfers under the fiscal revenue equalisation provision (Booth et al. (2007)). According to the cross-country study by Sola and Palomba (2015), market perception of implicit or explicit bailout guarantees has played an important role in investment in sub-national paper. They also show that sub-nationals that receive higher transfers and grants from the centre, access the credit markets less and at the same time pay less interest on their market borrowings. Beck et al. (2017) while analyzing data across countries including India, assesses the role of bailout capacity. The study explains the tendency of market charging higher premium for larger sub-sovereigns at the back of a perception on the limited bailout capacity of the federation vis-à-vis the potential larger rescue size (“too large to rescue”). The reverse according to the study, is also true for sub-sovereigns of smaller economic size (“too small to fail”). In the United States however, credit markets do appear to provide incentives for sovereign borrowers to restrain from borrowing as the spreads rise at an increasing rate with the level of borrowings before eventually the credit itself is denied (Bayoumi et al. (1995)). They also highlighted the significant role of state legislative fiscal rules in restraining excessive borrowings. The credibility of no bail-out clause was reinforced by the Eleventh Amendment to the United States Constitution that prohibits the central government from bailing out the states. Even across federations, market is found to penalise fiscal imbalances in many OECD countries with credible no bail-out policies. Haugh et al. (2009) documented evidence of ever larger increases in bond yield spreads of Euro area countries over benchmark Germany yield and concluded that fiscal policy can become increasingly constrained in response to financial market reaction to deteriorating fiscal fundamentals. Similarly, Von Hagen et al. (2011) in their study documented that markets in Europe have started penalising fiscal imbalances much more strongly with rising risk aversion post the financial crisis. Apart from a credible no-bail out policy, external auditing has been an essential element of the framework aimed at imposing fiscal discipline on sub-nationals through market pricing. Debt in regional governments in Spain is regularly scrutinized by rating agencies. OECD Economic Outlook 2003 notes “….the role of market in reinforcing sub-national rectitude imposed by fiscal rules, appears to be limited, because the conditions for effective market-based discipline are rarely fulfilled in practice. In countries that have traditionally relied on the market for fiscal discipline at sub-national level, such as Canada and the US, the self-imposed fiscal rules limiting policy discretion have actually resulted from the need to boost credit ratings. Elsewhere, however, the central government often guarantees sub-national loans and bails out…”. In Euro area framework, the transparency in terms of improved information available to market agents on state finances has also greatly helped effective risk assessment by the market. 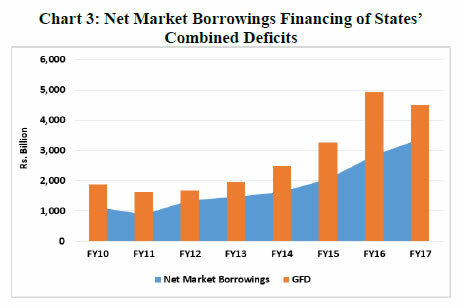 In the Indian context, states’ deficits and debts have been rising of late, resulting in rapid growth in states’ market borrowings, which are increasingly becoming comparable to the central government borrowing programme (Chart 2). Even with rising states’ combined deficits, open market borrowings have remained the predominant source of financing (Chart 3). Also, average borrowing size in the auctions moves up progressively over the fiscal year and is generally the highest in last quarter as states tend to make up for any shortfall from other financing sources (Chart 4). This results in bunching of SDL supply. Moreover, as shown earlier in Chart 1, market pricing of SDLs appears not to differentiate states with different issue sizes in an auction as reflected in similar yields within a very small range of difference. To examine what explains the premia faced by various sub-nationals on account of differences in credit quality and liquidity, the spreads of SDLs in fortnightly auctions conducted during 2015-16 and 2016-17 were regressed in a panel estimation (fixed and random effects) on variables measuring the fiscal performance in addition to auction-related variables. Specifically, we use the fiscal deficit or revenue deficit or outstanding liabilities each as a ratio to state GDP to proxy for credit quality. To reflect the supply impact, the analysis includes the notified (issue) size of the state to explain the spread. To control for the states’ liquidity, aggregate trading volume of SDLs is considered as another determinant of spreads to the very liquid central bond market. With the view that the prevailing interest rate structure and liquidity conditions could also drive the movements in overall yields of central and states’ securities, the funding liquidity constraints in explaining the spread are captured through weighted call money rate. Also, better prices can be expected for the states that rely much on grants and other transfers from centre. Since SDLs auction format is generally discriminatory, the analysis also looks at the possibility of aggressive bids by large institutional investors on SDL spreads that account for a large share (or full share in case of small sized SDLs) of notified amount in an auction. The frequency, i.e. time lapse measured in days between two auctions dates in which a state has participated, is also considered as it can also matter, at least for those states that do not create volumes with their infrequent and smaller presence in the market. Finally, ujwal discom assurance yojana (UDAY) bonds issuances in last two fiscals are also factored in, reflecting the increase in supply in excess of the State borrowing programme that could also be seen as impacting the spreads. (i) There is no significant impact of fiscal performance variables on the spreads. The finding suggests that market is not pricing the fiscal fundamentals of states into their calculations of SDL premia. The insignificance of fiscal parameters found is consistent with the findings reported by Bose et al. (2011) in their study on Indian states. (ii) In contrast, the auction-level yield spreads were mostly explained by differences in the size of the notified (issue) amount announced for an auction - larger the overall notified amount, wider being the spread. Large states that tend to have higher borrowing needs in view of their economic size, generally place higher quantum of their paper on sale in fortnightly auctions. Together, they could push up the overall issue size and thereby the yields. (iii) Surprisingly, the impact of UDAY bonds’ supply on spreads was not found to be significant. This could be due to the fact that major parts of these bond issuances were timed when the supply of central government bonds had stopped and the volume of SDL issuances had also tapered. As such, it helped to balance the overall supply. On analysing the auction data during the two years when UDAY bonds were issued (Chart 5), we observe that increase in aggregate SDL issue size and the anticipation of UDAY bond supply contributed more in widening the weighted average spreads of SDLs than the actual issuance of UDAY bonds. This is consistent with the view that widening of fiscal deficit that is anticipated due to greater debt servicing costs associated with higher bond supply would have an effect on long-term interest rates (Gale and Orszag (2003)). (iv) Among other determinants, the aggregate trading volume of state securities; weighted average call money rate; revenue transfers by Centre; the gap in the timing of bonds issued by the states and also the aggressive presence of large institutions in auctions are found to be negatively associated with spreads. The tightness in funding liquidity could be impacting central government yields more which could result in narrowing of the spreads. The negative correlation between spreads and revenue sharing by centre could be indicative of some kind of guarantee factored in by the investors. The regular and frequent presence of states in SDL market could help in better price discovery and lower spread. Also, the high demand for SDLs by large institutions which are generally buy and hold investors can cause the spreads to narrow. (v) Finally, the balanced panel estimation on annual dataset covering all the states for last six years reinforced the disconnect between the spread and the states’ fiscal indicators, suggesting investors’ indifference to the credit quality of the states. This implies investor perception of implicit central government guarantee for states and regulatory treatment of SDLs as being credit-risk free. Given the fact that individual states would continue to remain small issuers in the overall SDL outstanding, state-level consolidation of SDL issues along with investor diversification could help narrow SDL spreads. Further, careful assessment might have to be undertaken of various explicit or implicit guarantees and regulatory treatment of SDLs if it is deemed necessary to induce differentiation in inter-state spreads. ***, **, *: Significant at <1%, <5% and <10% levels respectively. Hausman test reports p-values for the null hypothesis of a random effects model vis-à-vis a fixed effects model. F and χ2 statistic test that the coefficients on the regressors are all jointly zero. Dependent variable is the SDL spread defined as the difference between the weighted average primary market yield of SDL on the day of auction and the secondary market yield of corresponding maturity of Central Government dated security on the same day. # The variable takes the value equal to total UDAY issuances (that took place between two auctions) and the same was assigned to all the SDLs in the subsequent auction (irrespective of states which issued UDAY). Alternatively, the variable takes the value limited to UDAY issuance for only those particular states that issued them whenever these states accessed the market next. The construction has been guided by the view that UDAY issuances (between two auctions) can affect SDLs of all the states appearing in the subsequent auction or can affect SDLs of only those states that issued UDAY in their next auction. Bayoumi, T., Goldstein, M., & Woglom, G. (1995). Do credit markets discipline sovereign borrowers? Evidence from US states. Journal of Money, Credit and Banking, 27(4), 1046-1059. Beck, R., Ferrucci, G., Hantzsche, A., & Rau-Goehring, M. (2017). Determinants of sub-sovereign bond yield spreads–The role of fiscal fundamentals and federal bailout expectations. Journal of International Money and Finance, 79, 72-98. Booth, L., Georgopoulos, G., & Hejazi, W. (2007). What drives provincial‐Canada yield spreads? Canadian Journal of Economics, 40(3), 1008-1032. Bose, D., Jain, R., & Lakshmanan, L. (2011). Determinants of Primary Yield Spreads of States in India: An Econometric Analysis. RBI Working Paper Series, WP 10/2011. Gale, W. G., & Orszag, P. R. (2003). The Economic Effects of Long-Term Fiscal Discipline. Urban Brookings Tax Policy Centre Discussion Paper. Haugh, D., Ollivaud, P., & Turner, D. (2009). What drives sovereign risk premiums? An analysis of recent evidence from the euro area. OECD, Working Paper No. 718/2009. Schuknecht, L., Von Hagen, J., & Wolswijk, G. (2009). Government risk premiums in the bond market: EMU and Canada. European Journal of Political Economy, 25(3), 371-384. Sola, S., & Palomba, G. (2015). Sub-National Government's Risk Premia: Does Fiscal Performance Matter? IMF Working Paper, WP 15/117. Von Hagen, J., Schuknecht, L., & Wolswijk, G. (2011). Government bond risk premiums in the EU revisited: The impact of the financial crisis. European Journal of Political Economy, 27(1), 36-43. 1 Seema Saggar is Director, Madhusudan Adki is Assistant Adviser and Rahul T is Research Officer in Internal Debt Management Department at the Reserve Bank of India (RBI). The findings and views in this paper are entirely those of the authors and should not necessarily be interpreted as the official views of RBI.